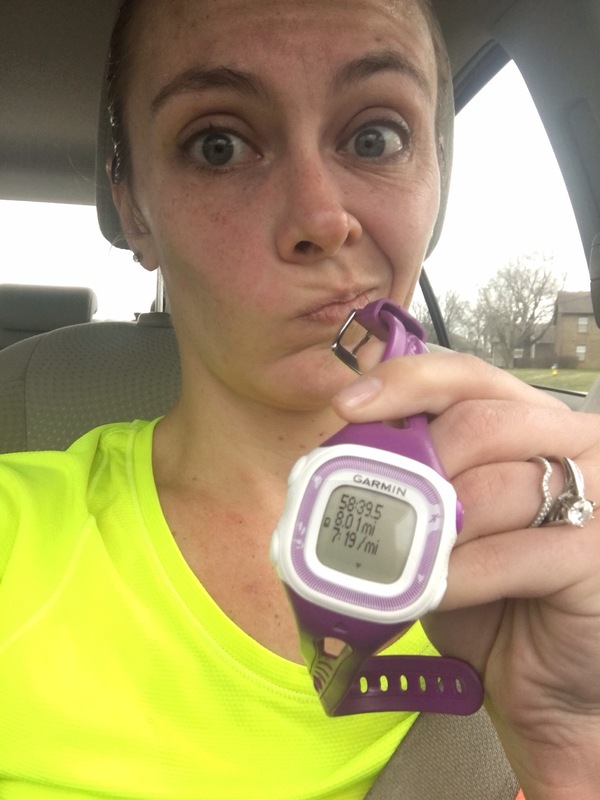 Weekly recap – Training begins for Carmel | Runner. Writer. Renegade. A great week even considering the terrible weather to wrap it up today. When coach loaded in my training schedule for the month, I glanced at it but didn’t give it a lot of consideration. My plan was to just tackle it one day at a time and not get lost in the big picture, which can be really intimidating. When you look 8-10 weeks ahead at peak weeks and wonder, “How on earth will I be able to do that,” you’re already creating self-doubt. Add to that the fact that Training Peaks doesn’t give me a weekly total on the phone version and I was pretty much just running. And that means today I totaled it up and was at 50.5 miles. I am in shape for that volume and don’t feel any worse for wear, but it’s definitely higher than what I’m used to for being 13 weeks away from my marathon. For Monumental this year I peaked at 55 miles two different weeks but nothing else was at 50+ (some 48-49 mile weeks). So, this is going to be interesting. I’m just going to stick to my plan and keep my head down and see where it takes me. Monday I logged an easy 6.25 from home, with my legs — quads and calves — still feeling beat up from last week’s barre tabata class. I was also thrown off my game by some errant weather — I ended up with clothes not warm enough for outside and too hot for inside, so I had to come home. As it turns out, it was warmer at my house than it was at my work and I would’ve been fine. But that’s okay. 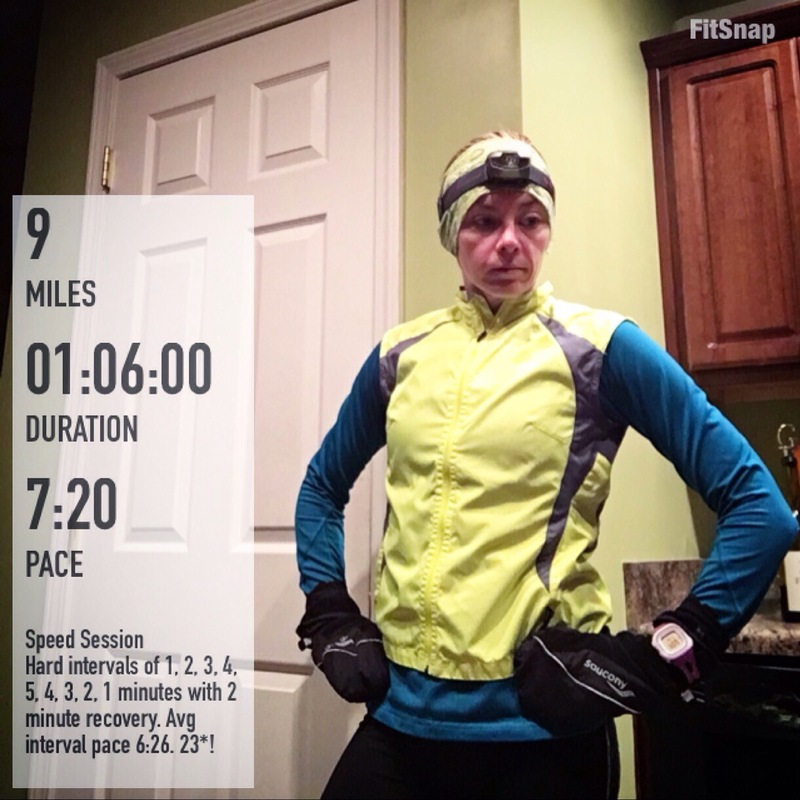 Tuesday was scheduled as my first speedwork under coach’s tutelage, but I bailed. I got a couple of miles iin and tried a strider and my legs were just junk still. 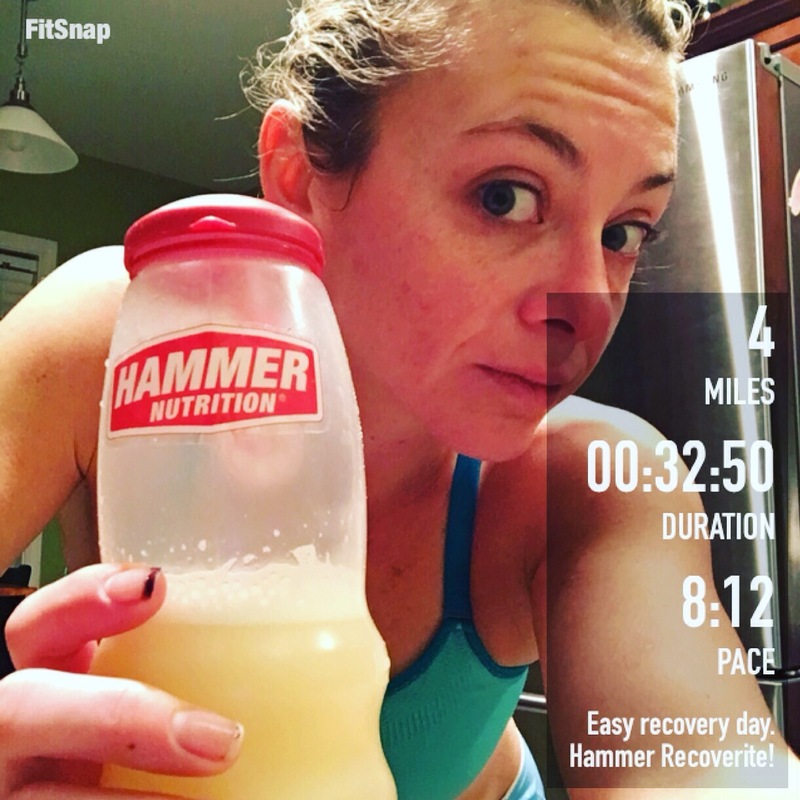 I swapped in Wednesday’s easy run, put in 4.25 recovery miles, and called it a day. I even skipped yoga in hopes my legs would hurry up and bounce back. I emailed coach that night and let him know of the swap. We agreed that there will be no additional squirelly plyometric-type exercises, especially not the day after a 10 mile race and especially not for an entire hour. Sticking with yoga and Pilates from here on out! Tuesday’s speedwork in 23 degrees. Fortunately by Wednesday morning things were back to normal, just in time to make my legs do some work. It was only 23* when I went running at 5:30 a.m., but hey, it’s January. It was an interesting ladder/pyramid workout, with hard intervals of 1, 2, 3, 4, 5, 4, 3, 2, 1 minutes each and 2 minutes recovery between each. That 2 minutes starts to seem awfully short in the 4-5-4 segment! My instructions were to not go all out but more of a tempo-interval. A nice early-season shakeout workout to remember what it feels like to go fast. But, with no specific time goals I was just running by feel and hoping I was hitting times that coach was looking for. (I was, he was happy.) I also went to Pilates that night — I don’t usually go on Wednesday nights anymore because the class lets out later than I like, but I wanted to make up a cross-training session since I skipped yoga. Thursday morning I had a really really easy 4 mile recovery run. Still cold — 25*. Also, still dark. Pilates Strength that evening.I took a vacation day Friday — I had orchestra tickets at lunch and we were leaving mid-afternoon for Nashville. I had a few options for my run — a moderate 8 miler with strides. I thought maybe I’d go before Pilates Strength at 8 a.m., if I woke up in time. I didn’t. It was chilly and rainy when class let out, so I decided to treadmill it. I got my headphones and headed up the stairs … then realized it was going to stop raining and I could go outside after the orchestra concert! I ran errands instead — ones that I was going to run after the orchestra — and then headed down for the concert with my friend Eileen. We had a great time — Rachmaninov’s Second piano concerto is truly my favorite and it was awesome to hear it performed live. After that, I dropped Eileen off at her house (conveniently located) and headed out. What I’m learning about working with Coach Ebersole is that I have to find more nuance in my running. Typically I consider runs on a 1-to-4 scale: really easy (7:50-8), pretty easy (7:40-7:50), quick (7:20-7:40) and speed/race/chased by a bear (anything under 7:20). Obviously there are specific workouts, like tempo runs, that call for a faster pace that isn’t the same as racing, but readers will also recall my tendancy to skip workouts so … moot point. Coach Ebersole, though, has like 10 points on his scale. Friday’s run was a great example. 8 mile “moderate” run with heart rate 70-75% (easy runs are 60-75%) plus striders at 800-1600 race pace, not an all-out sprint. First, my HRM strap is totally busted. I’ve ordered a new one but it’s not here yet. Credit to Garmin — the one I’m using I purchased in 2009. I replaced the battery recently but I think there’s no saving it. Since replacing the battery it has been telling me my HR is maxing in the 240s. Either I have a heart condition or it’s gone crazy. Doesn’t get back to normal until about 3 miles in. Anyway. I wore the HR but didn’t pay it much attention. I just strove for a comfortable but slightly harder than normal pace — thinking I’d run in the 7:30s, probably. Surprise! The first mile was easy at 7:42, then a 7:29, and then my legs just took off. 7:13-720 the rest of the way, excluding mile 7 which included most of the striders. Then it snowed. Well, iced more than snowed. It rained much of yesterday evening and overnight, and at some point turned to snow and got really cold. That meant all the rain froze. They’re not very good at clearing the roads here, so when I woke up today it was 21 degrees with a windchill of 10, winds in the 20 mph range, and everything was covered in ice. Terrific. I don’t mind cold and snow, but I do mind ice. My theory is that falling and getting hurt is worse than a long run on the treadmill. Also, considering the footing (and based on times I saw from friends on Strava), I would’ve been out in 6* windchill (it dropped while I was at the gym) for like 3 hours. So as much as I did not like the idea of 14 on the treadmill, it was the winning option. 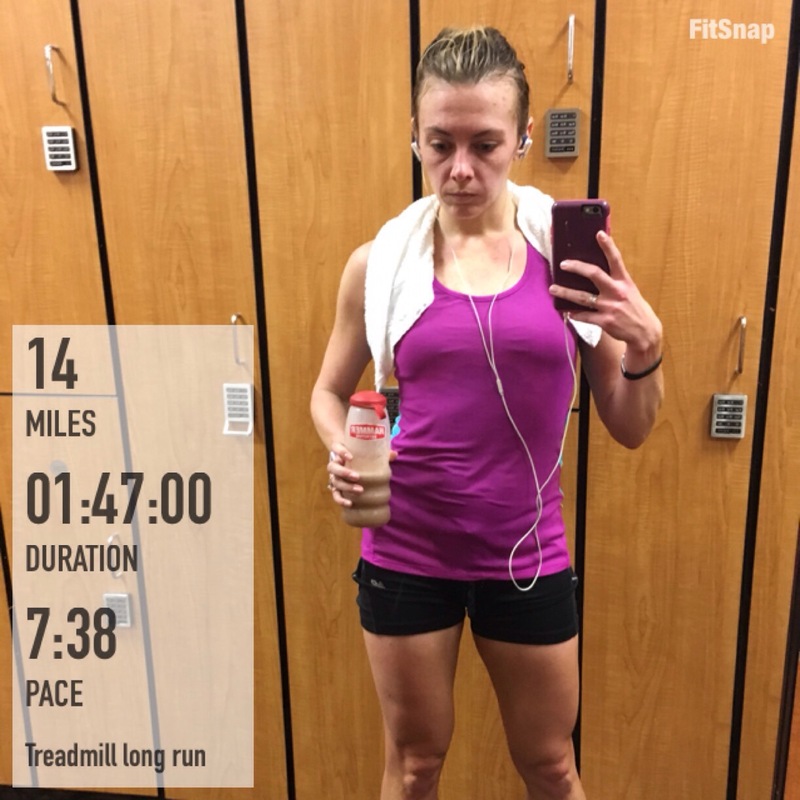 Plus, I’ve done long runs split between the treadmill and indoor track (11.5 laps per mile), so I had that option too. I had downloaded a three-episode TV miniseries when I thought I was going to end up on the treadmill last week, but ended up being able to run outside so it remained unwatched. Perfect. Me, Daniel Craig and Gabriel Macht. Worse things have happened. Usually when I run on the treadmill I schedule breaks. When running on the roads, I have intermittent stops to cross roads, stretch, get water, etc., usually every few miles. So I apply a similar routine to the treadmill, whch gives me a way to break it up and have some milestones along the way. As crazy as running 14 on the treadmill sounds … it really wasn’t bad. I am 100% sure it was more enjoyable than running outside would’ve been. Coach’s instructions were to keep the run easy and relaxed because I have a workout on Tuesday and he’d prefer two easy days between the long run and workout. I kept the treadmill on 7:53 for most of the run but picked it up over the last 2.5-3 miles simply because I was ready to be done! Received a big Hammer shipment this week! Love! It was a total “fueled by Hammer” day, too. 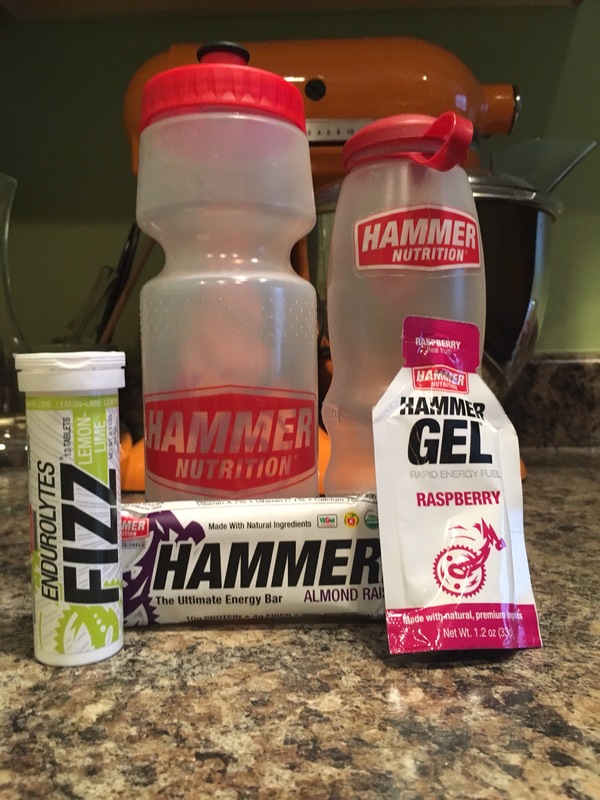 I had a Hammer Bar before I left, lemon-lime Endurolytes Fizz in my water bottle, a raspberry Hammer Gel at mile 9 and chocolate Recoverite after. Somehow, this totaled 50.5 miles without me even noticing, plus 3 Pilates sessions. Did I mention I’m working on my instructor certification? Hopefully within a week or so! I’ll plan a separate post just on that. Also, stay tuned for a review of Matt Fitzgerald’s “How Bad Do You Want It” — a book on mastering the psychology of mind over muscle, and the importance your mindset plays in your training and racing success. I’ll leave you with an excerpt that fits well with my thoughts throughout this post about working with a coach. Sounds like a great week! How did you decide to get a coach? What was your process like when picking one? Post coming on that topic soon!